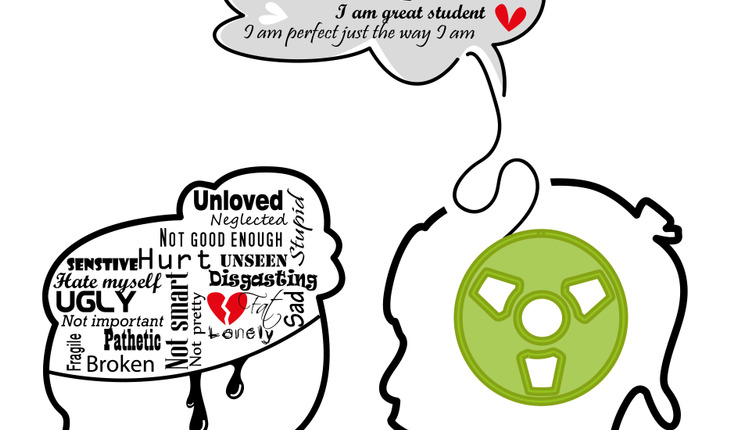 Most of us received plenty of negative messages growing up, which now manifest as incessant chatter inside our heads. Is there a way to make it stop? Is there some escape from the negative criticism? The answer is yes! I have developed a special way to help people through the various difficulties and challenges we all face in life. I call it Creative Positive Reframing (CPR) and it’s a process that actually changes the neural pathways in your brain so that limiting beliefs such as I’m not good enough, young enough, smart enough, thin enough, or whatever-enough are transformed and actually become supportive rather than destructive. Pay attention to your thought processes. Action: The best way to pay attention to your thought process is by focusing on how your body feels. Is there a knot in your stomach, a lump in your throat, a clenched jaw? Once you identify this negative feeling in your body, pause to notice what you’ve been saying to yourself. Negative thoughts such as, “I can never make ends meet!” Or “I’m too fat, old, poor or stupid!” are self-sabotaging. This may not be obvious at first, and may require you to be quiet and check in with yourself consciously. Practice: Interrupt it! Once you’ve identified those tight areas and the negative messages, shift your focus. Take a deep breath and interrupt your own train of thought. Then insert something positive, such as something you’re grateful for: The warmth and safety of your home; the positive relationship with your spouse, kids, pets, or anyone you love. Interrupting the thought process of “not enough” and focusing on gratitude stops the negative spiral from spinning out of control. But it is only the beginning. Action: Nature abhors a vacuum. When you are caught in a negative thought spiral, it’s time to get rid of the negative to make room for the positive. Practice: Get rid of it! Pull out a pad of paper and write out all the garbage spiraling in your head. Write about not having enough, not being smart enough, pretty enough, good enough. If you feel stuck, write about feeling stuck. Keep writing until the thoughts stop coming. And then tear that paper up or burn it! Replace the negative with positive statements. Create an ideal scenario and know why it is important to you. Action: If you have a negative loop about financial fear or sadness about being alone, start thinking about the flip side and write about the ideal. Practice: Write about it! Describe your ideal situation in writing, be as specific as possible: Describe yourself living the life of your dreams, actually feel how good it feels. And then focus on why it’s important. Examine why having more money or a great relationship would make a difference in your life. Do you feel scared, financially insecure, unsafe, lonely? Keep going deeper until you hit the heart of it; when you have hit it, there will be an emotional charge linked to it. Allow yourself to feel the depth of that emotion. Creative visualization – Picture the ideal and embed it in your brain. Action: This next step takes the previous step and solidifies it; it is a powerful process. Creative Visualization is a technique that uses your own power of “seeing” to attain that which you most want or want to change. You already use this technique every day. Unfortunately, we often use it in the negative by imaging all the things we DON’T want. Practice: Visualize it! The key to visualization is to first see what you want, and then create a mindset that you already have it and you believe you deserve it. Relax and be sure you won’t be interrupted. Close your eyes and let the movie of you having your heart’s desire run in your mind. Really see yourself in a beautiful new home, feel the warmth of the sun as it streams through the windows, picture the colors and the art on the walls; or picture yourself in a satisfying and wonderful relationship, feeling cherished and loved. Enjoy the process. The more you do this, the more deeply embedded this vision becomes. This process is the most powerful piece, solidifying the previous steps. Action: Happy people usually feel like they are in more control of their lives and therefore feel more confidence and optimism. Unfortunately, our brains are wired to look for and focus on threats, based on when we were hunters and gatherers. but times have changed so it’s time for a reboot. Practice: Be positive about it! Instead of focusing on threats, focus on love and compassion, forgiveness and gratitude. Simply thinking about someone you love can shift you from a negative mindset to a positive one. Take time every morning, to focus on something you are grateful for, and on what it is you want to create that day and in your life. Developing this practice will immediately positively impact your day. Action: Get creative! While focusing on shifting limiting beliefs into more positive and supportive ones, an expression of creativity can shift our mood and remove us from a negative spiral. Practice: Play with it! Start journaling and play with words; use oil pastels and play with color; garden and play in the dirt; cook and play with spices. There is no right or wrong way to be creative. The only important thing is to allow ourselves to connect with our own creativity. Have fun with it, feel uplifted. Patti Clark is an accomplished speaker and workshop leader dedicated to helping people through various life transitions on their journey to an extraordinary life. For more than 30 years, and over several continents, Patti has been sharing her knowledge and wisdom with others. Her new book, This Way Up, is her latest endeavor. She is a native of the San Francisco Bay Area, has a B.A. in Social Sciences from the University of California at Berkeley and an M.A. in Education. She has taught English at the University of Wisconsin, Madison and at Oregon State University. Patti’s work has been featured in several publications including The Wall Street Journal, The Boston Globe, and The Mindful Word. Patti spends part of her time in the United States, and part of her time in New Zealand. Patti spends part of her time in the United States, and part of her time in New Zealand. She and her husband and their two sons live near the beach on the Coromandel Peninsula. For more information visit www.thiswayupbook.com or www.patticlark.org.